After 7 days, 14 hours and 21 seconds, Francis Joyon is the first skipper to cross the finish line of the 2018 Route du Rhum. The last few miles of the race kept all the spectators on their toes to find out which of François Gabart or Francis Joyon would win this final duel. François Gabart, who led this crossing for almost all of the seven days, finally finished second with only 7 minutes and 8 seconds behind Francis Joyon. In addition to this incredible finish, Francis Joyon beat the record set by Loïck Peyron in 2014 which was 7 days and 15 hours. On November 4, at the start of Saint Malo, François Gabart and Francis Joyon were the only two sailors to have broken away from the 123 boats competing, facing the three lows that crossed the Bay of Biscay. 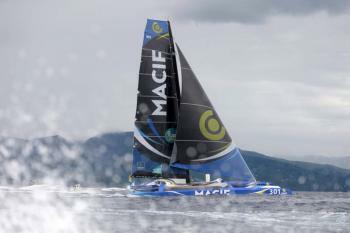 The two skippers offered us the second tightest finish in the history of the Route du Rhum. This grandiose hand-to-hand combat fully animated this end of the race, which was particularly decisive during the round of Guadeloupe, renowned for its traps and extremely tactical nature. The third skipper of the Route du Rhum to cross the finish line could be Armel Tripon aboard his trimaran. For the Imoca monohulls, everything is still possible with an expected arrival on Friday 15th November. For the Class 40 monohulls, Yoann Richomme has taken a certain lead over Phil Sharp and Kito de Pavant. The Route du Rhum is not a race without hazards. From the first few miles, the first damages arrived. Several competitors stopped, either to repair or to solve technical problems. On the day of departure, Willy Bissainte's boat (C' La Guadeloupe) ran aground on Rouzic Island. His 50-foot monohull lay on its side, victim of an ingress of water. The skipper then activated his distress beacon and was rescued by the SNSM of Ploumanach at around 10 pm. Like Willy Blissainte, whether you are a professional or amateur sailor, think about your safety equipment when you go out to sea. SIMY offers for sale My-AIS, an ultra-compact marine distress beacon at only 199€. In case of distress, once My-AIS is activated, an alert is sent to the surrounding boats (within a range of 5 to 10 nautical miles) and to the nearest CROSS, with your GPS coordinates. SIMY congratulates the 2 skippers who arrived, for the magnificent show and suspense!